Take a virtual vacation across Europe! 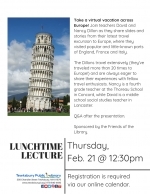 Join teachers David and Nancy Dillon as they share slides and stories from their latest travel excursion to Europe, where they visited popular and little-known parts of England, France and Italy. The Dillons travel extensively (they've traveled more than 20 times to Europe!) and are always eager to share their experiences with fellow travel enthusiasts. Nancy is a fourth grade teacher at the Thoreau School in Concord, while David is a middle school social studies teacher in Lancaster. Q&A after the presentation. Sponsored by the Friends of the Library.